Mother’s Day is just around the corner and this is the time to get mother the gift she will love. We (me and some of my friends) have been discussing what can be a great Mother’s Day gift this year. And thought I should provide some gift ideas for my readers. It’s always a great gift to cook for your mum on Mother’s Day and share a great lunch or dinner. A magazine subscription is a good Mother’s Day present as well (Recipes Plus and Gourmet Traveller if she fancies good food). It’s the gift that keeps on giving all year round! You can check out this special promotion on Magshop.com.au where you can win one of four health retreat escapes at The Golden Door by subscribing or renewing to your favourite magazine. Now, here is a great recipe to cook this Mother’s Day. 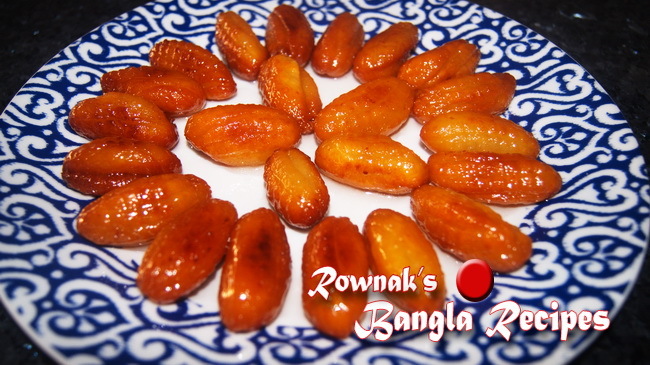 This is a sweet Bangladeshi traditional snack which imitates the look of date fruit. There are many ways to make this snack. Some people like to soak in syrup and some like to add sugar in it for long shelf life. I will soak Khejur (Date) Pitha in syrup in this recipe. I tried to keep this recipe very simple and with few ingredients. I used desiccated coconut instead of freshly grated coconut. If you want, you can omit coconut, though coconut gives great flavour to it. . Some even love to add bit baking powder which is optional and up to you. Hope you enjoy the simplicity of Bangladeshi cooking. Also needs strainer and sterilised comb . 1. Make the syrup by mixing the sugar with 1 and ¼ cup of water. Keep syrup aside and let it cool down. 2. Combine all of the remaining ingredients together, add some lukewarm water and mix until it forms a dough..
3. Knead well and divide it into 25-30 balls. 4. Take one ball and press over strainer. 5. 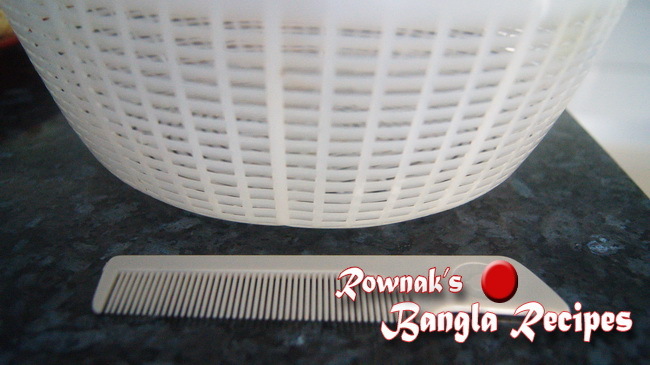 Use the comb to comb the dough which will make it roll like date fruit (see video) . 6. Repeat the process with rest of balls. 7. 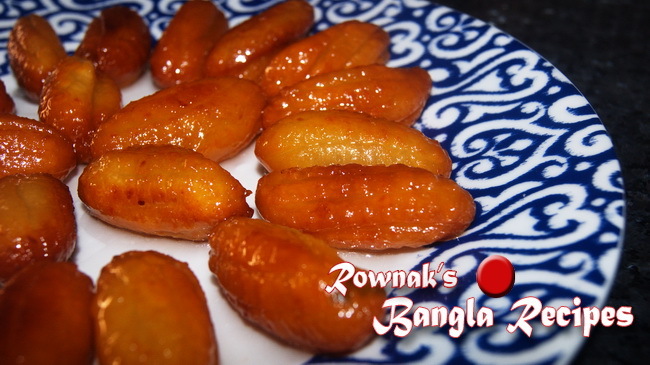 Heat the oil and fry Khejur (Date) Pitha on medium heat till it becomes golden brown. 8. Take it out from oil and soak in syrup for 10 minutes. 9. 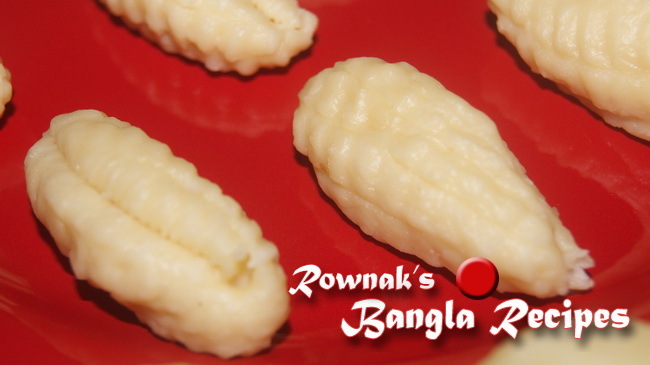 Enjoy the beauty and taste of Khejur (Date) Pitha. 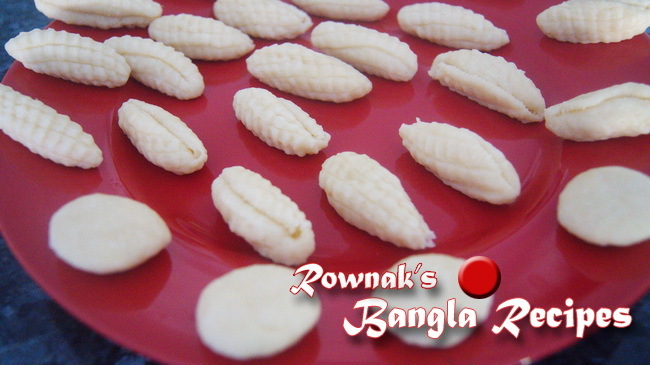 wow …………………….. khejur pitha osadaron …………………………………………..